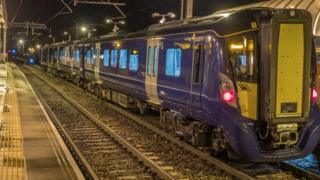 The first journey on the new electric ScotRail route took place early on Wednesday morning. The Class 385 train travelled between Edinburgh and Linlithgow, the first trip on the electrified line. It is one of 70 trains being introduced to Scotland's busiest route, from Edinburgh to Glasgow via Falkirk. The project has been hit by delays and risings costs. Further testing is needed before a launch date will be decided "at the turn of the year". The train completed the journey at 02:00 on Wednesday, testing the infrastructure and overhead equipment. Built by Japanese company Hitachi, it is still waiting for its interior to be fitted. As part of the Edinburgh Glasgow Improvement Programme (EGIP), the electric trains will, at first, only run between the two cities. Once these have been introduced, the 385 trains will also operate on suburban routes south of Glasgow and to Dunblane, Stirling and Alloa. The trains do not have a heavy engine, meaning that they are able to travel faster than the diesel trains currently in use. They will also be able to offer passengers more seats, say ScotRail. Ian McConnell, director of programmes and transformation for ScotRail Alliance said the trial "was a hugely important step towards completing the electrification of the line." "That it has gone so well tells us that we are almost ready to begin the next stage - which is to start fully testing the new trains themselves," he said. According to ScotRail, once final safety checks have been carried out along the remaining areas of the route, full testing of the new trains will begin. Andy Radford, Hitachi Rail Europe programme manager said: "We've now got trains at our factory in Newton Aycliffe ready to travel to Scotland as soon as they can run on the new electric power line."